Home / Oriana Lamarca Designs / Are you a dreamer? Are you a dreamer? If so green garnet is your stone! The vibrational pattern of green garnet creates confidence and motivation to get down to business and make things happen. As Yvonne states in her blog, “the energy of this month is all about the transition from rest and reflection to explosive growth and expansion. 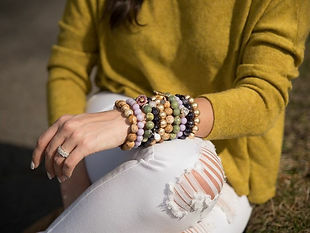 Be fertile and plant your own seeds of goals, dreams and wishes!” So step outside of your norm with green garnet armcandy as I show you how to pair it easily with other colors you may already have and feel the positive vibes come to life! One of my favorite armparties is this months cover. I just love the palette of greens and turquoise, so fun for the spring and summer and the perfect pop to any basic outfit, or not so basic outfit. Another one of my favorites is the combination of greenery and amethyst for contrast & a lush vibe. Purple and green have always been known to be a good match. They are the perfect opposites of dark and bright. Pairing greenery with a purple stone makes it stand out and adds some contrast. They are both nature colors, which is another reason they pair so well together. But the best way to really show off a color? Complement it with a color that is it's opposite on the color wheel. In this case, pinks and reds are opposite of greenery, so look for those if you really want the color to look its best. Two of the best ways to do this with jewelry are 1) Color-blocking the stones together or 2) Wearing something that has greenery in it and complementing the outfit with a pink or red stone. 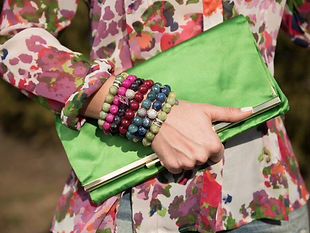 Here I’ve paired it with a floral top and marsala jade, amethyst, teal jade and magenta jade armaprty. The combination of pinks and reds along with the fact that they are darker tones than the green help the green garnet to really pop.